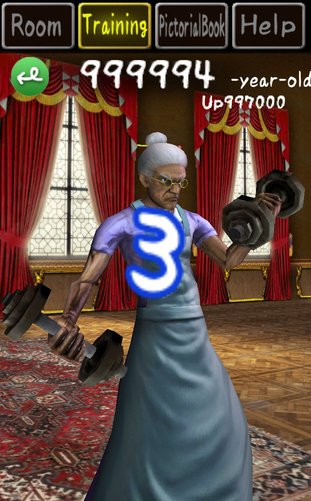 You can swipe around the old hag. Let's throw the old hag and it will be rejuvenated! If you want to rejuvenate quickly just select training. If you want passive training, just go with voluntary training! But I have a simple trick that is better compared to the voluntary training! Get stylus or any thing that will work on your touchscreen device. You can use hotdog or chopped finger (optional) in this simple trick. Go to the room (in-game) and swipe down at the hag using your chosen item that will respond on your screen (ex. Hotdog). Leave the "Hotdog or chopped finger" on your screen and that's it! You will be rejuvenated passively without time limit and more faster than voluntary training.